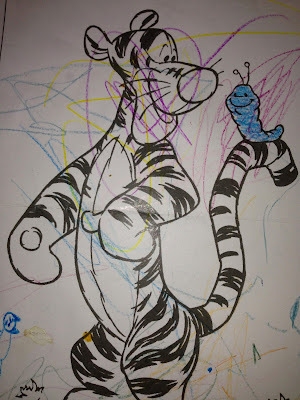 Coloring Without Borders: Whaddya mean, "Coloring Without Borders"? Doctors Without Borders, known in most of the world as Médecins Sans Frontières, does important work in war-torn or desperate countries around the globe. Meaningful work. Vital work that saves lives and gives hope to those who most need it. By contrast, this blog may be mildly interesting to a handful of people. My life right now centers around my toddler son, who just turned two. Jackson recognizes few boundaries. Everyone is a potential friend or playmate. He has almost no sense of danger — he'll run off a ledge and simply assume you'll catch him. If a crayon or pencil or pen is in reach, he's likely going to color on whatever surface is available, delighting in bold strokes and giant loops arcing across the page. He invites our dog to "play Legos, Mattie." All things are possible, inanimate objects are anthropomorphized, you can't possibly be correct that he has eaten the last Cheerio because there must be more somewhere in the bag and he really does want to eat Cheerios and please more Daddy more Daddy please please more Daddy he REALLY thinks you're just unnecessarily withholding Cheerios while you're driving down the highway. A chance encounter with a live "statue" street performer in Glasgow now leads Jack to inquire about each stone statue he sees: "Not move, Daddy?" He pulls his shirt over his head and announces "I'm hiding!" 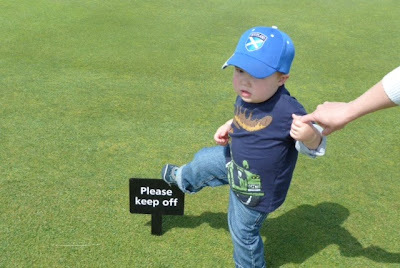 Jackson likes to push the boundaries, just as a toddler should. Jackson's life is full of possibilities, not limitations. Almost anything is possible. The world does not yet have many restrictions or logic. His coloring typifies his life view. Like any toddler, Jack won't color within the lines on a page from a coloring book, not even if he had the fine motor skills to do so. What would be the fun in that? Instead, he explodes the boundaries with exuberant slashes cutting across the page or intense scribbles in the empty space. I think this coloring suits the personality of Tigger. I want to live my life a little more like Jackson colors. I know, I know, I have responsibilities and a family to care for. A profession to practice. And there's retirement planning to think of. So I can't — won't — go whole hog and abandon all those things that make me an upstanding member of society. But I want to push myself a little, stretch the boundaries of how life is supposed to go. Quit my job, move to another continent, and hope it'll all turn out fine? Done. 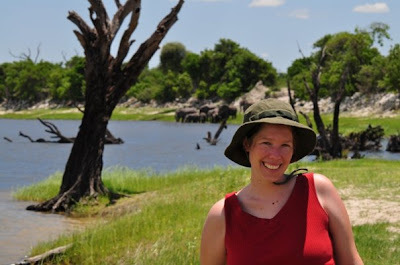 This blog will focus on traveling and living without borders. For me, the best travel and the best life experiences come from visiting foreign countries and learning new cultures. A seven-country European trip after high school (thanks, mom and dad!) opened my eyes to the world. A dozen years later, my life was changed after spending a month in China in 2004 — more than enjoying the amazing sights (both manmade and natural) Kate and I visited, it was a perspective-altering trip that helped redefine how I viewed life at home in the U.S. 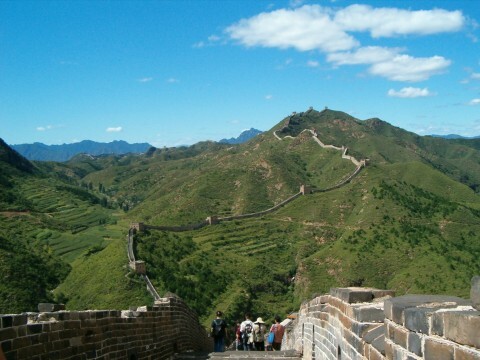 The massive boundary of the Great Wall served to keep China isolated from the wider world. 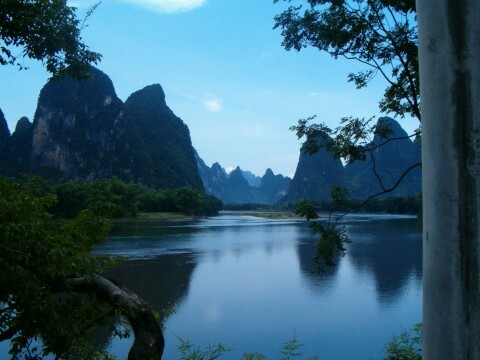 The drama of the karst mountains in southern China reminds me of the severe beauty of the Scottish highlands. If traveling for a few weeks at a time can have a powerful effect on my life, how profound will it be to live abroad? When the opportunity to move to Scotland came up, we couldn't say no. I'm inspired by family and friends who have stretched the boundaries in their own lives. My sister-in-law, Rachel, has hiked through contested Kashmir to the base camp of Mt. Everest. 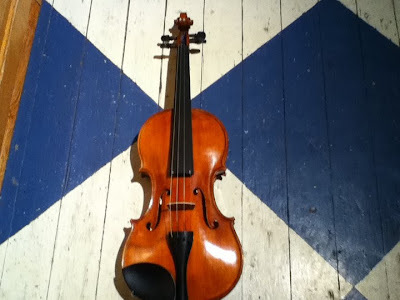 She made the jump in mid-life from being a wildlife biologist to training for three years as a luthier (i.e., a violin maker). 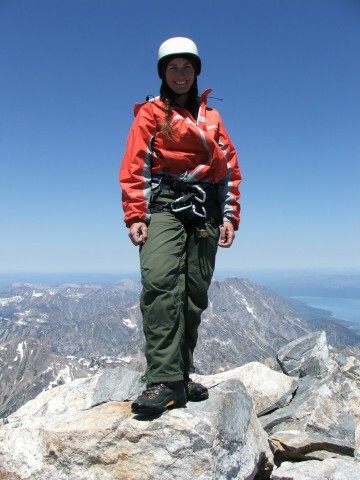 Rachel at the summit of Grand Teton in Wyoming. My godmother, Martha, moved with her husband from the U.S. to Indonesia in the 1960s — a far greater life change than moving from the U.S. to Scotland in 2013. That same fortitude had her living without assistance alone in her home into her nineties, and she remains a lucid and independent soul. Friends from various stages of my life have moved overseas to pursue careers, whether in business or law or as part of the U.S. Department of State. I'm inspired by all of them and the courage they've shown. Foreign Service Officer Sara during her posting in Zambia, herd of elephants in background. I want to travel and live without borders. Jackson is along for the ride, which hopefully will serve him well as he gets older. Eventually he'll learn to color inside the lines, but I hope he also retains some of the spirit to color without borders. It was a good one, wasn't it? ;) Still holds true.